Jean's Quilting Page: Still celebrating and another giveaway! Most of you know that I teach quilt making classes at two local shops. One of my favorite classes is the Circle and Spin quilt. I've taught it many times and made several different versions. It's fun to teach because quilters who are afraid to try circular patterns are always excited about the fact that they can make them using this technique. I love the abstract, but circular design of the finished quilt. I am still celebrating the publication of Fade to Pink in McCalls Quick Quilts magazine today with another giveaway....visit my patterns on Craftsy and tell me which one you would like to win in the comments below. I don't have Circle and Spin quilt pattern listed on Craftsy at this time, but I will add it to today's giveaway as well. So enter below using Rafflecopter for your chance to win two great patterns! If you are a no comment blogger, please add your email address to the comment so I can contact you if you win. 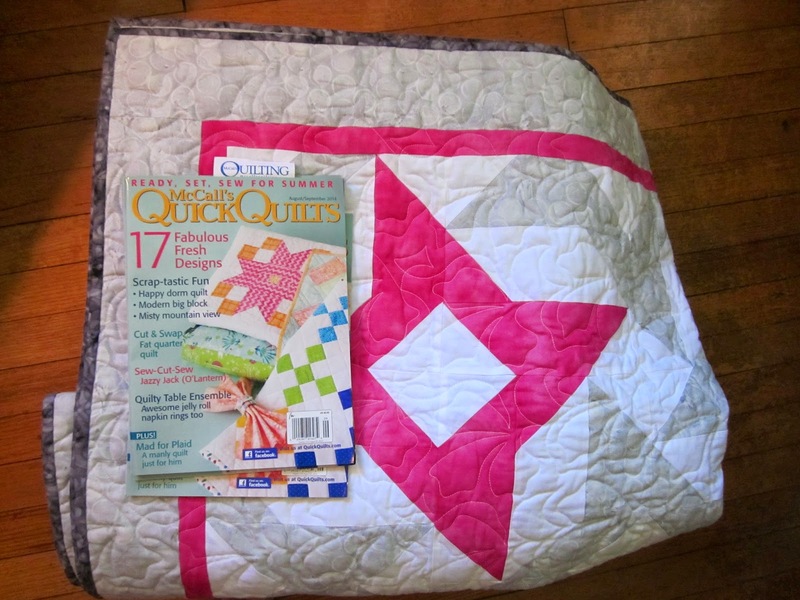 The giveaway for the 2 McCalls Quick Quilts magazines or a $40 gift card to Fat Quarter Shop is still open until Friday, but you have to go to the original post to enter that drawing. I will choose all giveaway winners on Saturday, July 5. Today I'm meeting with the final member of the last Beginning Quilting class. She was going out of town and couldn't come to the finishing classes so will be learning how to tie and bind her quilt. Which way is up? or Ms. Tess. I remember when I used to play around with making pieces/patchwork. I'm wondering when my brain decided that the part I really want to get to is the quilting! Twisterweave or Peas in a Pod. Love your designs! I like Tangled In The kite Strings.. Always need to use up lots of scraps and fabric.. I like how doable "Peas in a Pod" looks. Still just a confident beginner. Would love to learn the circle quilt you showed today. Hi Ms. Jean! I think your Twisterweave pattern is really neat. I'm still learning how to quilt, have only 2 under my belt so far...lol. The Circle and Spin would be a fun challenge as well. Have an amazing day! Tangled in the kite strings~ my scraps are overtaking my world! ;-) Thanks for the fun! I can't decide between Peas in a Pod and Which Way is Up ! I like Peas in a Pod. I'll be starting on your 'snake dance' soon. I'm changing the name to 'Intertwined', since it will be a wedding quilt for my son. I like Peas in a Pod. Thanks. I like Peas in a Pod. Looks like a fun one. Which way is up! Story of my life. Oh I hope I win. Love quick quilt magazine. always something new and fresh to inspire me. I love Which Way is Up and Tangled in the Kite Strings!!! Love your new pattern in McCalls Quick Quilts. Checked out your patterns on Craftsy, and having a hard time choosing just one. Have narrowed it down to Tangled in the Kite Strings and Twisterweave. Thanks! Loving "Which way is up?"! I would pick "Peas in a Pod"